Elegantly slender conifers that can reach 60 feet in height with only a 3- to 10-foot width, Italian cypresses (Cupressus sempervirens) look best near tall buildings, as their proportions are too towering for single-story structures. Native to the Mediterranean, the trees produce 1/2- to 1-inch brown cones and prefer sites with full sun and slightly acidic, sandy, fast-draining soils in U.S. Department of Agriculture plant hardiness zones 7 through 11. If planted in sandy coastal areas, Italian cypress care will not be cumbersome but they can be susceptible to insects and disease when growing in heavy, wet soils inland. Italian Cypress tree water requirements vary from season to season. In areas with dry summers and wet winters, it's a good idea to plant Italian cypresses in fall to give them a rainy season in which to become established before their first dry spell. Once they have settled in, the drought-tolerant trees should need a deep watering only about once a month during the summer and no irrigation at all for the rest of the year. Susceptible to root rot, they won't tolerate excessive moisture. If you apply 2 to 3 inches of compost as a mulch, you shouldn't need to provide other fertilizer, as overfeeding can increase pest problems. When spreading that mulch, be sure to keep it pulled several inches back from the trees' trunks to avoid covering their root collars. 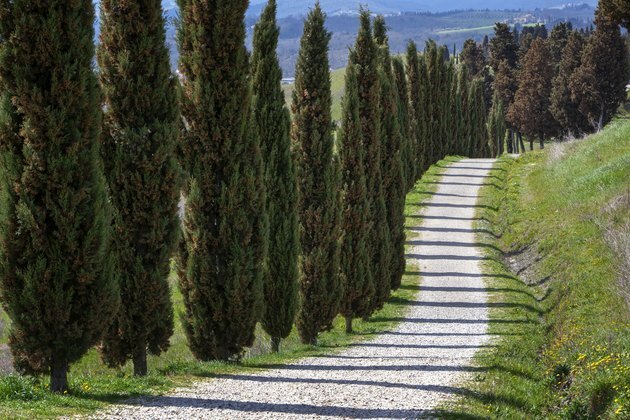 Although Italian cypresses can add 3 feet to their height each year, they have a naturally columnar shape. Therefore, they seldom require pruning except on those rare occasions when one of the branches deviates from the tree's typical upright form. In that case, you should just cut out the offending branch. If the tips of your Italian cypresses begin to yellow, check for cypress canker, which is indicated by sticky sunken lesions on the bark of the branches. Although there is no cure, you may be able to halt the disease's spread in an otherwise healthy tree by removing all affected branches, though this grooming will adversely affect the natural shape of the tree. When pruning those branches, make sure that you cut all the way back into wood that isn't infected. Sterilize your pruning shears as you work, by dipping their blades between cuts in a solution of 1 part bleach to 9 parts water. To prevent spider mites from infesting your cypresses and giving their foliage a dry or mottled appearance, wash the trees with a stream of water from a hose about once a week during the summer. Spray them in the early morning to give them time to dry before nightfall. Bagworms -- caterpillars which eventually form silky bags on the branches of cypresses after stripping the green from their branches -- also can be a problem. To kill those caterpillars when they are at their smallest size, spray your trees in mid-May with an organic insecticide containing Bacillus thuringiensis. Use 4 teaspoons of the concentrate per 1 gallon of water -- or whatever amount is indicated on the label for bagworms -- and wear goggles, a respirator and protective clothing while applying it. Repeat Italian cypress maintenance treatment in early June. After mid-August, the caterpillars will be protected by their bags, which you will have to remove by hand at that point. What Causes Italian Cypress Trees to Turn Brown?